THE TAKE HOME: Melatonin controls mitochondrial DNA and Dopamine controls how we decipher and sense time between the inside and outside world. Creating melatonin in the eye is the most critical surface for humans. Melatonin controls all regeneration of the photoreceptors in man except the Muller cells in the eye. Both of these chemical molecules are made by sunlight as it collides with aromatic amino acids in our eye to slow light down. That is how they link to one another. Now, this blog tells you how they work in a cell. The same elements in the sun’s light that emit its spectrum are the same elements used in living tissues. This is strong physical evidence of molecular resonance at work. When our bodies have ample supplies of electrons from DHA and protons from food and water it is infinitely more healthy to go out in the sunlight where high-intensity visible photons control the electric structure of the living body in cells by creating it and replenishing it wirelessly using proteins as light antenna’s. This is how the light of the sun programs atoms in is to do the things required of life on planet Earth. That energy and information are buried in the frequencies of the visible spectrum between 250nm-780nm and IMPRINTED onto electrons protons and light using OAM. 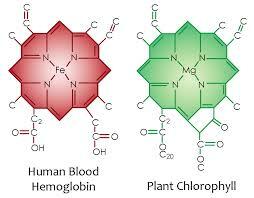 Hemoglobin and chlorophyll are both porphyrins photochemically active within 250nm-780nm and respond well to the heartbeat of the Earth at 7.83Hz. Why should this make you curious today? Do you know all the pieces? Do you know how they fit? Is there more information that living things are capable of getting from the suns light that you are unaware of? Does the sun provide us with a “light friction”? It does. The sun gives us a “light massage” with frequencies as a message to our skin and eyes. How so? Every 5 minutes the sun breathes in and out just as you do and the plant does. The sun respires by shifting and broadening its spectral lines. 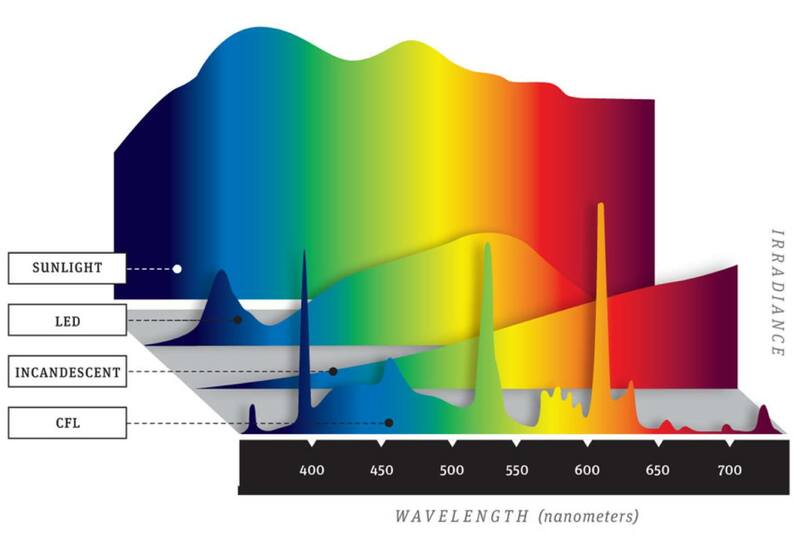 A spectral line is a dark or bright line in an otherwise uniform and continuous spectrum, resulting from emission or absorption of light in a narrow frequency range, compared with the nearby frequencies. 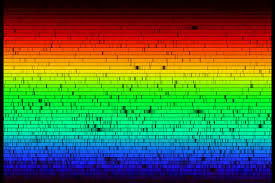 Spectral lines are often used to identify atoms and molecules in the sun. This motion provides living things with information and as it does the proof that it occurs is that astrophysicists have seen shifts through the spectrum in the Fraunhofer lines as this process occurs over 5 minutes. The Fraunhofer lines ability to shift is actually is communicating information about “many broadening effects” in the suns light on the “breathing frequency” of the sun to things here on Earth. This information transferred to living systems via a molecular resonance effect. These lines are the sun’s barcode for life. I will remind you that light, photons, are called the force carrier for the electromagnetic force. This force carrier is how information is transferred between things made of matter everywhere in the universe. This includes trees, bacteria, and animals. That breathing frequency seems important in ways we don’t yet understand. Currently, biology and all of the branches of science have no idea what it might link to, but I have an idea what connection might be. I think it is the way circadian cycles are linked to the golden ratio in sunlight and are subsequently imprinted in the addition or subtraction of electrons and protons interacting with aqueous proteins of all living things. It provides living things with the fractal reality of nature which everything relies upon. Anytime molecular resonance is engaged some method has to include this fractal element to link to the fabric of nature. This tells us what is natural EMF from a solar source and it tells cells what is not natural EMF. 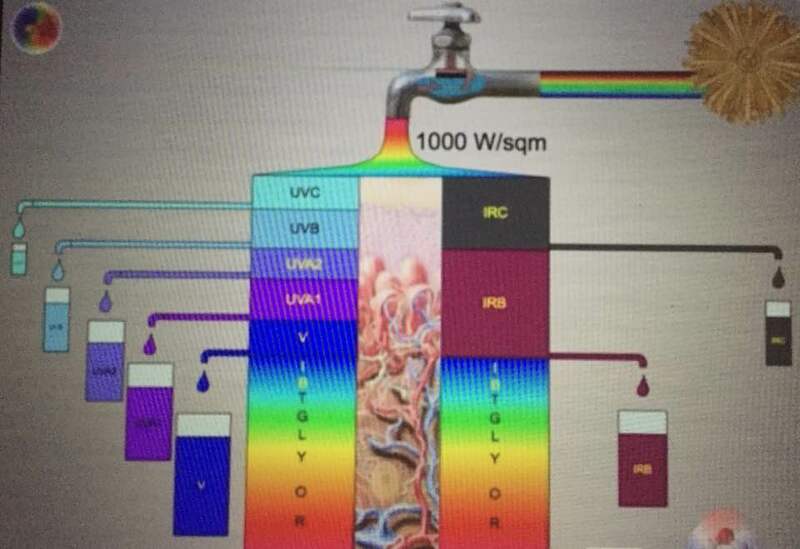 This explains why sunlight can make a special type of water (DDW) from the visible spectrum of sunlight but all other parts of the spectrum seem to diminish the amount of water made or changes its physical characteristics. This is one reason why I a leery of manmade light effects. I think there is a lot more than meets the eye in this story for cells. This is important for signaling flows of information and energy. Our cells are attuned deeply to nature and not to alien light sources that do not use a circadian coupling to control waveforms. This is the basis of “Phi”, “the golden ratio”, and “Fibonacci’s sequence”, in all things, in nature in my humble opinion. Melatonin and dopamine are made first in the eye when sunlight has UV-A and IR-A light present. The eye is loaded with special collagen’s that make a large coherent domain in exclusion zone (EZ) of water. It also slows light down from its speed in space and the environment as it comes to our retina. Slowing light in front of the RPE is the key to understanding how quantum biology creates time and reality we get. The exclusion zone is the first quantum step in building the living state but not the only one. Within the EZ, forms coherent domains (CD) of water that form the redox pile of electrons that drive all biochemical reactions. The anterior visual pathway has more DHA in it than any other part of the human brain. I will be talking about this next week in Vermont. Why is this all important? Collagen, DNA, and DHA really use SHG to make the living state a reality. These interactions in the eye remove its dipole characteristics seen in the bulk water and allow exclusion zone water to build a large net negative charge. Sunlight changes bulk water so it takes on the “molecular look” of ice structures which can be thought of as a polymer of water. In ice, water crystals are arranged in hexagonal shapes to create a honeycomb geometric fractal pattern. In the exclusion zone state of water, protons are naturally excluded as a first step, so the protons in one layer of water that bond to oxygen in an adjacent layer is no longer possible, and this will not allow the EZ to attain an ice-like rigid structure at the molecular nanoscale, but it does allow a liquid crystalline state to manifest easily in the presence of light alone. This is why liquid EZ is a fluid because it cannot have a rigid structure as ice would. But this fact about ice is a key point to understand how life is built. This fact about ice and bulk water should make you think back to the last chapter of my first book now, The Epi-paleo Rx. The polar ice caps were the “protective key” to life returning on land and in the sea after a loss of solar light. Since ice has no net negative charge, it means that it cannot be affected by any altered electromagnetic waves from the sun. The electromagnetic force only deals with charged molecules and atoms. This makes ice the ultimate Faraday cage for the spectrum of light too. Would life forms find this useful during extinction events to protect the liquid crystalline state so living things could easily bounce back when the collisions of the sun rays returned to excite water in cells? I think so. This is why the cold seas could have offered excellent protection to early life to mitigate phase transitions of energy from the sun in all previous five extinction events. The initial net negative charge of the EZ built by sunlight rebuilds the coherent domain sizes in cells and allows for cells to become disturbed and awakened by light when it returns and the electromagnetic force can resume the process of survival. This is how many animals survived a low quantum yield environment after the KT event 65 million years ago when photosynthesis was disrupted for some time by the dust cloud from the collision. Sunlight provides 1000 watts of energy per square meter normally. When the number is decreased by an asteroid or by man’s geo-engineering things alive pay a biologic toll for this. How does life respond to extinction events when sunlight power is lowered? It must first re-establish the quantum coherent bio-photon field in a living cell to maximize both local freedom and global cohesion. The key molecules after this bio-photon field were rebuilt was melatonin and dopamine. Both hormones are built by UVA light and IR-A. How could we build local autonomy and be able to transfer energy rapidly from the local to global parts of the biosphere and vice versa during these events? Local autonomy was the domain of melatonin because it controlled mitochondrial DNA locally in tissues. Frequency matching of sunlight to biologic rhythms can do it. Melatonin is the key to understanding circadian control. Melatonin is built by aromatic amino acids that are photon traps for AM UV-A light. This is why AM light is critical to good sleep. We now know that all biologic circadian rhythms are built around irrational multiples of one another under the steady state normally found on Earth. Those environmental conditions are usually destroyed in extinction events. 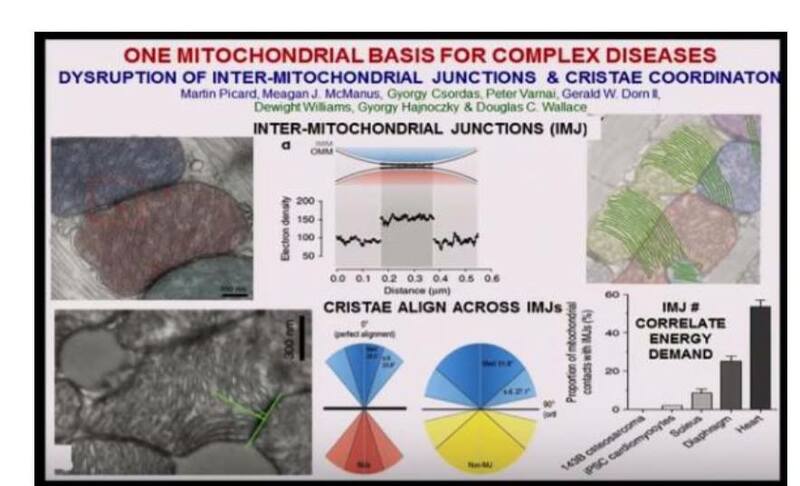 In the Time blog series, I told you that melatonin controls mitochondria DNA dynamics and all energy flow in mitochondria. Mitochondria are globally distributed in humans and they are all linked to by a 100 Hz oscillation by the inter-mitochondrial junctions (IMJ’s) in mitochondria. That electro-mechanical vibration in healthy mitochondria comes from the collisions of electromagnetic waves on the surfaces of the body that then deliver these energies to proteins that turn the light waves in electromechanical waves in the cytosol where a mitochondrion sits in a sea of water it creates as it makes energy. The less energy it generates the less water is made in the cytosol and this changes the state of the possible vibration. Melatonin is disrupted by nighttime light and can cause problems for women with breast cancer. This change in vibration is what alters the physiologic function of the cell by way of the molecular resonance of converting light waves into electro-mechanical waves in RBC’s, cell membranes, and blood plasma where these electromechanical waves are affected by sound waves and mechanical waves of compression. The IMJ’s alignment is the key to energy generation and demand in a particular tissue. Look at the bottom right of this picture to see how critical it is according to McManus’s work. Researchers in Dr. Wallace’s lab found this amazing link between vibrations and geometry in a cell (McManus). Melatonin locally controls the heteroplasmy rate between the respiratory proteins and that rate change causes alterations in vibrations that can develop in the local mitochondria in various tissues. We also now have data that melatonin affects the nuclear genome as well. It can be generalized to every mitochondrion in the local tissue just by molecular resonance contained in the circadian cycle oscillators (sun, Earth, moon). Those vibrations can be frequency matched by the Schuman resonance and the bio-photon field created in cells by sunlight and the water made in the cytosol by mitochondria. Within this EZ in cell water made by sunlight, we get a coherent domain (CD) creation. This CD system makes up 13% of the EZ by volume and makes a massive amount of electrons to make a DC electric current available to cells to use for regeneration and to run the 100,000 biochemical reactions that occur every second in every cell in our body. Sunlight, specifically UV-A and IR-A light, create the EZ water in cells provided that the person is assimilating sunlight with their behaviors. The CD is critical in the building of the coherent bio-photon field using our liquid crystalline state that mitochondria provide to get the job done. The vibration varies if the person is under the man-made light because its incident spectral frequency is not similar to sunlight frequencies at all. Neuroscientist Warren Meck thought that the basal ganglia’s dopamine loop was an internal clock because of its activation during temporal processing. It turns out it is likely a gear used in the SCN optical clock activated by the sun. Meck was the first to postulate that the rate at which signals traverse this loop offers the brain a timekeeping mechanism. No one linked it to the SCN as a distal target of the optical lattice between the retina and basal ganglia. We know now that increased dopamine increases the rate of the basal ganglia loop cycling. This forges connections between disparate parts of the brain. This suggests that more dopamine we make the faster our internal clock would seem. Our perceptions would be associated with a slower perception of external time. Time dilation 101. This occurs with increases in body temperature and yokes perfectly to UV light’s ability to make dopamine in the eye during the daytime. Darkness lowers levels of dopamine levels and a slower rate of neural circuit frequency would correspond to a slower internal clock and a perceived acceleration of external time. This is likely why low dopamine states are associated with time contraction and disease states and are linked to circadian de-coupling events. Today the microwaved blue-lit world is the major de-coupler of humans. The association in dopamine and melatonin is a non-linear relationship because both molecules are created and linked to specific light frequencies and this makes the relationship not so clear-cut for those who do not understand non-linear optics well. The under- or over-activity of the dopamine system is linked with impairment inaccurate time estimation, sometimes making it seem slower, sometimes faster. There is no obvious or linear correlation between perceived speed of time and the amount of dopamine present as one might suspect but I believe there is a fractal relationship due to a lack of UV-A and IR-A light perception in the retina. 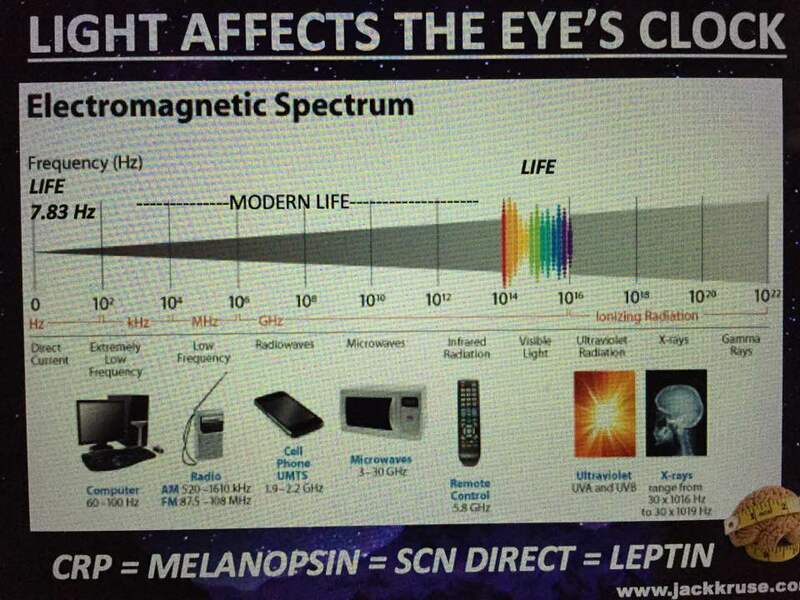 Both of these frequencies are critical in melatonin and dopamine creation in the eye, retina, and eventually in the brain. In the brain’s EEG, as in the heart’s ECG, “just right” frequencies occurs between chaos and order. Man’s technology is now interfering with the control the natural heartbeat of the Earth with technology use of light waves for communication. The ELF- waves geo-magnetic field link to the human alpha wave in the brain and it should not be yoked by frequency matching from anything man has built. Do you think man-made light cannot affect your brain waves or your heartbeat? You’d be dead wrong if you believe this. 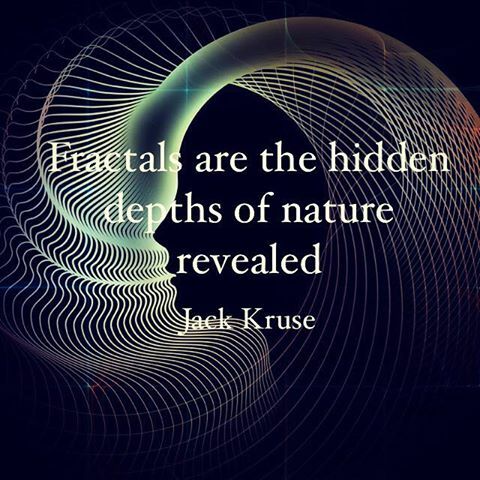 The reason it is possible is that nature’s fabric is based upon a key fractal tied to a fractional number buried in these naturally occurring waveforms. Fractals are characterized by their “fractal dimension,” which is a non-integer number. The key irrational number in nature is called “phi”. It is also called the golden ratio. When you divide 22 by 7 you get this number ratio. Where the dimension of a straight line is one, and a rectangle is two, a fractal line drawn on a piece of paper will have a dimension between one and two. The greater the complexity of the line, the closer its dimension is to two. Similarly, a fractal area will have a dimension between a non-fractal surface (with dimension two), and a volume (with dimension three). CAN YOU GIVE ME A BIOLOGIC EXAMPLE OF A FRACTAL? The Schumann Resonance from the Earth’s core and the alpha wave of the human brain seen on an EEG are both the same frequency at 7.83 Hz. On an electroencephalogram (EEG) we get waveforms that depict the electrical activity occurring at the surface of the brain on the neocortex. The neocortex of the human brain oscillates at 40 Hz when we are healthy. Even the DNA within the nucleus oscillates at a specific electromagnetic frequency. This frequency varies by tissues. This occurs best when dopamine levels in the brain are optimized for electrical functioning. Dopamine normally increases the signal to noise ratio in the brain, facilitating pattern recognition both in space and across time. This is key to global control of the circadian system of man. Timing and global control have to be linked to a cell to make sense of the chaos in the environments waveforms. A lack of dopamine in the retina or brain decreases the signal to noise ratio; this decreases our ability to recognize patterns, trends, or changes in our environment. This causes a de-coherence in cells. This is how a physicist would explain it. A regular person would describe it as a shorting out of the system. A blown fuse, so to speak. It simulates what a “brown out” may look like in living thing. This is why people with Parkinson’s disease get an expressionless face, seem to lose their emotion, and why their muscle motions seem to slow down so much. Thinking is slowed and cognitive haze develops. These are the terms people use to describe a low dopamine state. Low dopamine states affect the global control of the organism and it also impairs the ability to change the environmental landscape too. You become less adaptable to any change internal or external in the environment. A low dopamine state is always a signal of poor energy generation in mitochondria. The Schumann resonance is a form of natural extreme low-frequency waves that can heal us. A lack of them is quite problematic and has been the well studied over the last 60 years as the video below shows. Recent work on motor neuron disease has also pointed a finger at man-made extreme low-frequency waves used in communication as a cause of neurodegeneration. The use of very low-frequency light for communications in professional sports is now widespread. Could this be why so many sports figures come down with ALS, PD, AD, and frontotemporal dysplasia? Here are a few names who are afflicted with ALS: Lou Gehrig, Steve Gleason, Tim Shaw, Dwight Clark, Ezzard Charles, Marián Čišovský, Jeff Capell, Sid Collins, Neale Daniher, Bruce Edwards, Jim Catfish Hunter, Jimmy Johnstone, Glenn Montgomery, Don Revie, Fernando Ricksen, Kevin Turner, Gianluca Signorini, Ed Sadkowski. Look at the picture below. Look at where the Schumann resonance is in relation to the visible spectrum of solar light. Note where modern communication devices are. Those waveforms are ruining the circadian coupling mechanism that allows the human thalamus to generate the alpha wave and this leads to these disease mentioned above. Every last one of them is circadian-based due to a lack of dopamine and melatonin and a lack of the coupling frequency to make sense of the signal. When dopamine drops the signal to noise ratio falls and we get an interference signal in the retina and brain and not one of clarity. Many other professions now use low-frequency light for communications too. Clinicians need to be made aware of these correlations. We need to realize the use of low-frequency communications is akin to using light frequencies out of the normal visible spectrum that falls to us here on Earth. We just do not get how these links lead to a loss of energy from our mitochondria. Anytime man subtracts frequencies in sunlight for illumination or for communication it leads to up-regulation of the AMPk pathways and glucose metabolism. The reason is simple. The incident light wave is not solar and it creates a less strong electro-mechanical wave in cells. This alters mitochondrial oscillations and the oscillation changes the physiologic abilities in mitochondria. This is called a redox shifted mitochondria. This is what Warburg warned us about 100 years ago. This is Nora Volkow (2011) and Allen Frey’s (1960-70’s) work confirmed in their own experiments. How many more times do we have to be told this information before we begin to pay attention to it???? Scott, one of my members said, “stubborn and rigid paradigms are probably the largest prisoner of society.” Might we be ignoring it because our brains are all suffering from a low dopamine state because of the environment humans have built? Cell metabolism is dependent upon the light that a cell senses from the eye and skin, so it follows our modern man-made light environment might lead to an abnormal acoustic response of the colony of mitochondria within our neuron pool. Today, we know that man, essentially, is a being of light. And the modern science of photo-biology is presently proving this in the literature. In terms of healing the implications are immense. We now know, for example, that quanta of light can initiate, or arrest, cascade-like reactions in the cells, and that genetic cellular damage can be virtually repaired, within hours, by faint beams of light. We are still on the threshold of fully understanding the complex relationship between light and life. Drugs that stimulate dopamine in the retina, frontal lobes and brain stem system treat many neurodegenerative conditions like ADHD, myopia, and Parkinson’s disease. People with diseases like ADHD actually have a quicker sense of internal time which makes the external world seem to pass more slowly, hence why they sense boredom easily. Drugs like Ritalin, Adderall, and Vyvance–increase dopamine production and change time perception in the brain, enhancing focus and learning. Ritalin also works to suppress ‘background’ firing of neurons not associated with task performance, allowing the brain to transmit a clearer signal to its target regions. This is one reason why nnEMF affects attention and awareness because it lowers dopamine levels. Focus and attention come easier when one’s CNS is not being pulled down multiple pathways by contravening evoked potentials from man-made electromagnetic waves. Paying attention, establishes traction between your internal frequencies and the external world, synchronizing with it, using it to help calibrate your internal pace of timing. The mitochondria in that neocortex are best yoked with the 100 trillion colonies of mitochondria in our brain that fat burn while vibrating at 100Hz. What controls them all and synchronizes them so they do not interfere? The golden ratio, phi, is the key to how nature keeps the symphony of nature’s waves from falling into chaos. Being fractal organized is a way for a natural system to be in touch with itself, talking to itself, but not locked into any decision process. This implies the system of nature is always coherent, connected, but is able to change at any moment. Nature is built to be locally free to interact but have a global cohesion. Remember that each neuron in our brain has between 3000-6000 mitochondria. This seemingly would create a lot of wave interference in the brain if we have a 40 Hz signal of the neocortex, and trillions of organelles that vibrate at 100Hz, while the thalamus of the brain is the source of the EEG waves mentioned above. The waveforms in the brain’s EEG and in mitochondria can’t co-exist if they’re fixed at one frequency, but if they’re all over the place, that also doesn’t fly. A fractal relationship creates a geometric compromise that nature’s symmetry requires. The most familiar classification uses EEG waveform frequency in the alpha, beta, theta, and delta waveforms. Did you know that all of these different waves are linked by the Fibonacci sequence which is also related to the golden ratio called PHI? This ratio is the key to understanding fractals. The Fibonacci sequence is all based on the longest “phi wave”; also called the carrier wave that couples these waves and allows the waves to share their energy by molecular resonance. This golden ratio is required to connect the waves and allow energy transfer in both human Electrocardiogram (ECG) and the brainwaves in electroencephalogram (EEG) of humans. This means that the geomagnetic pulsations of the Earth are phase matched to the human brain and the energy contained in them can be shared with the human brain in a wireless fashion. Amazing what nature can do, isn’t it? Did you know that Jackson Pollack painted fractally? In fact, fractal geometry was not yet discovered when Pollack first painted by fractals intuitively in 1943. Pollack was an alcoholic. Alcoholism is associated with a low dopamine state in the brain. Without dopamine, the brain does not experience time well. In fact, this may be why Pollack painted in fractals. The world he saw was very slowed down by the lack of dopamine in his brain, and this altered his perception of it. He then painted what he perceived. Without dopamine, it appears Pollack’s brain painted the visuals his eyes were capable of seeing because they were frozen in time without the motion that dopamine would have given his retina and frontal lobes. The absence of dopamine is the root of the extremely slowed or frozen states of patients described by neurologist Oliver Sacks in his book Awakenings. Jackson Pollack’s fractal work circa 1948. It wasn’t until 1975 that the eminent mathematician Benoit Mandelbrot coined the term fractals to describe patterns that are self-similar across different-sized scales, a “middle ground” between order and chaos. This link between order and chaos is codified in the human brain. The alpha wave in the human brain controls sleep and much of circadian coupling in the SCN. Did you know this? Are you beginning to see how man-made nnEMF can ruin circadian cycles yet? Energy transfers in coupled cycles can move up and down the fractal hierarchy. This is how the environment nature provides transfers the energy and information of the sun, Earth, and moon into our thalamus just like music changing octaves. This energy transfer is called molecular resonance. Electromagnetic energy waves from the sun, Earth, and moon is able to connect to neurons by resonating across levels. Mid-dimension fractals have been shown to produce a strong alpha-wave response which corresponds to a fully relaxed state. This occurs when we just close our eyes. It also can be induced by looking outside at trees with leaves which have a strong visual fractal for the retina and can elicit a strong beta-wave response. This brain waveform indicates a high ability to focus. A fractal system always strikes an optimal balance between variability and order because of its relationship to a fractional number. This statement is an eye opener for a “mitochondriac”. Are you starting to see the reality of where ADHD, myopia, Parkinson’s disease, and circadian diseases come from yet? Are you beginning to see how these things change energy generation in mitochondria? If you do, you are a “high dopamine state mitochondriac“. If not, my bet is your dopamine level is pretty low and your surrounding environment is microwaved and blue-lit and filled with a lot of RF/microwave radiations. You have to change your environment if that is where you are now. The human brain has many waveforms and frequencies cycling at different rates simultaneously. Moreover, many, if not all, contribute to one’s internal experience of time. When dopamine is lacking we can perceive and sense the fractal side of nature. 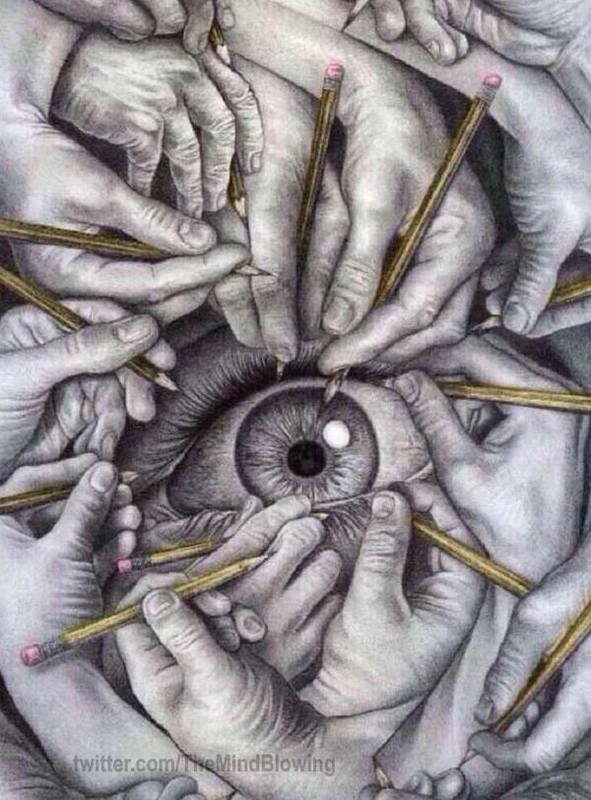 Pollack’s artwork is a good example of this. Many mental illnesses are associated with a low dopamine state and those patients report a frozen existence of reality. Many depressed patients describe their life seems like ‘still photos’ of a flickering vision, like a movie-film which is running too slow on the screen. The ability of the brain to keep all these different frequencies inappropriate relationship and order to one another, smoothing the flow of connecting thoughts and actions, is what dopamine helps facilitate. Photons of light come to Earth in a timeless state. It takes the matter in cells to create time using UV light photons. By themselves, photons would perceive the world, as frozen. Light photons have an interior temporal indivisibility prevents the perception of external divisibility. We now know UV light is critical in the creation of dopamine in our eye with aromatic amino acids as the sun’s antenna. We also believe all complex life emerged when our sun got to mid-age and began to emit more UV light photons and it appears this was the stimulus that created an environment to allow life to speed up and become complex 600 million years ago. I work constantly to slow the gears of the “eye clock” where dopamine is first made to “stretch time” out for my patients. Note how many hands it takes to slow time down. Nature is much simpler when you tap sunlight and grounding to do it. Sacks, Oliver. 1999. Awakenings. New York: Vintage Books.